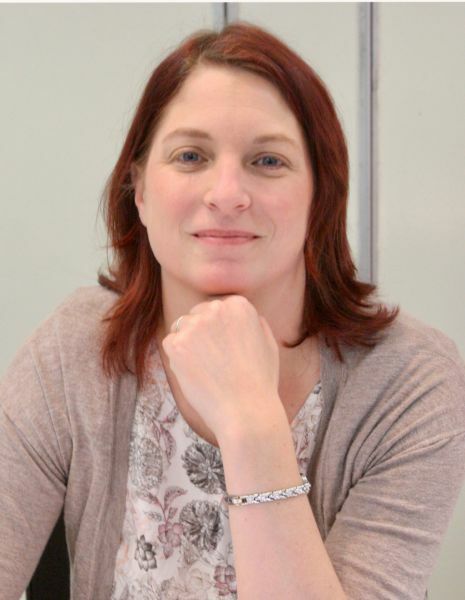 As the senior immunologist for the Ebola and pre-erythrocytic malaria vaccine trials, I oversee the immunology on Phase I and II trials of vectored vaccines, both in the UK and in field trials in Africa. We use the chimpanzee adenovirus, ChAd63, as a priming vector and modified vaccinia virus (MVA) as a boosting vaccination and these viruses encode proteins from the organism that can elicit protective immune responses in our vaccinated volunteers. The aim of my research is to define vaccine-induced immunological parameters that correlate with protection from malaria. I have access to samples from our volunteers that I can study using methods such as ELISPOT, flow cytometry and transcriptional profiling. By combining data from these different assays and analysing how these different measures relate to protection against malaria, I have been able to define the function and phenotype of T cells that are associated with protection in our human challenge model. These findings can then be relayed back through the vaccine development process to improve the immunogenicity of our viral vectors for future trials and hopefully increase vaccine efficacy. BACKGROUND: Heterologous prime boost immunization with chimpanzee adenovirus 63 (ChAd63) and Modified Vaccinia Virus Ankara (MVA) vectored vaccines is a strategy previously shown to provide substantial protective efficacy against P. falciparum infection in United Kingdom adult Phase IIa sporozoite challenge studies (approximately 20-25% sterile protection with similar numbers showing clear delay in time to patency), and greater point efficacy in a trial in Kenyan adults. METHODOLOGY: We conducted the first Phase IIb clinical trial assessing the safety, immunogenicity and efficacy of ChAd63 MVA ME-TRAP in 700 healthy malaria exposed children aged 5-17 months in a highly endemic malaria transmission area of Burkina Faso. RESULTS: ChAd63 MVA ME-TRAP was shown to be safe and immunogenic but induced only moderate T cell responses (median 326 SFU/106 PBMC (95% CI 290-387)) many fold lower than in previous trials. No significant efficacy was observed against clinical malaria during the follow up period, with efficacy against the primary endpoint estimate by proportional analysis being 13.8% (95%CI -42.4 to 47.9) at sixth month post MVA ME-TRAP and 3.1% (95%CI -15.0 to 18.3; p = 0.72) by Cox regression. 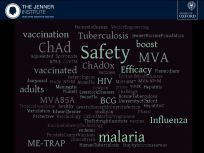 CONCLUSIONS: This study has confirmed ChAd63 MVA ME-TRAP is a safe and immunogenic vaccine regimen in children and infants with prior exposure to malaria. But no significant protective efficacy was observed in this very highly malaria-endemic setting. TRIAL REGISTRATION: ClinicalTrials.gov NCT01635647. Pactr.org PACTR201208000404131. Background: The 2014 West African outbreak of Ebola virus disease highlighted the urgent need to develop an effective Ebola vaccine. Methods: We undertook two Phase I studies assessing safety and immunogenicity of the viral vector MVA-EBO-Z, manufactured rapidly on a new duck cell line either alone or in a heterologous prime-boost regimen with ChAd3-EBO-Z followed by MVA-EBO-Z. Adult volunteers in the UK (n = 38) and Senegal (n=40) were vaccinated and an accelerated one week prime-boost regimen was assessed in Senegal. Safety was assessed by active and passive collection of local and systemic adverse events. Results: The standard and accelerated heterologous prime-boost regimes were well-tolerated and elicited potent cellular and humoral immunogenicity in the UK and Senegal, but vaccine-induced antibody responses were significantly lower in Senegal. Cellular immune responses measured by flow cytometry were significantly greater in African vaccinees receiving ChAd3 and MVA vaccines in the same rather than the contralateral limb. Conclusions: MVA biomanufactured on an immortalised duck cell line shows potential for very large-scale manufacturing with lower cost of goods. This first trial of MVA-EBO-Z in humans encourages further testing in Phase II studies with the one week prime-boost interval regimen appearing particularly suitable for outbreak control. We assessed a combination multi-stage malaria vaccine schedule in which RTS,S/AS01B was given concomitantly with viral vectors expressing multiple-epitope thrombospondin-related adhesion protein (ME-TRAP) in a 0-month, 1-month, and 2-month schedule. RTS,S/AS01B was given as either three full doses or with a fractional (1/5th) third dose. Efficacy was assessed by controlled human malaria infection (CHMI). Safety and immunogenicity of the vaccine regimen was also assessed. Forty-one malaria-naive adults received RTS,S/AS01B at 0, 4 and 8 weeks, either alone (Groups 1 and 2) or with ChAd63 ME-TRAP at week 0, and modified vaccinia Ankara (MVA) ME-TRAP at weeks 4 and 8 (Groups 3 and 4). Groups 2 and 4 received a fractional (1/5th) dose of RTS,S/AS01B at week 8. CHMI was delivered by mosquito bite 11 weeks after first vaccination. Vaccine efficacy was 6/8 (75%), 8/9 (88.9%), 6/10 (60%), and 5/9 (55.6%) of subjects in Groups 1, 2, 3, and 4, respectively. Immunological analysis indicated significant reductions in anti-circumsporozoite protein antibodies and TRAP-specific T cells at CHMI in the combination vaccine groups. This reduced immunogenicity was only observed after concomitant administration of the third dose of RTS,S/AS01B with the second dose of MVA ME-TRAP. The second dose of the MVA vector with a four-week interval caused significantly higher anti-vector immunity than the first and may have been the cause of immunological interference. Co-administration of ChAd63/MVA ME-TRAP with RTS,S/AS01B led to reduced immunogenicity and efficacy, indicating the need for evaluation of alternative schedules or immunization sites in attempts to generate optimal efficacy. Despite recent advances in treatment and vector control, malaria is still a leading cause of death, emphasizing the need for an effective vaccine. The malaria life cycle can be subdivided into three stages: the invasion and growth within liver hepatocytes (pre-erythrocytic stage), the blood stage (erythrocytic stage), and, finally, the sexual stage (occurring within the mosquito vector). Antigen (Ag)-specific CD8+ T cells are effectively induced by heterologous prime-boost viral vector immunization and known to correlate with liver-stage protection. However, liver-stage malaria vaccines have struggled to generate and maintain the high numbers of Plasmodium-specific circulating T cells necessary to confer sterile protection. We describe an alternative "prime and target" vaccination strategy aimed specifically at inducing high numbers of tissue-resident memory T cells present in the liver at the time of hepatic infection. This approach bypasses the need for very high numbers of circulating T cells and markedly increases the efficacy of subunit immunization against liver-stage malaria with clinically relevant Ags and clinically tested viral vectors in murine challenge models. Translation to clinical use has begun, with encouraging results from a pilot safety and feasibility trial of intravenous chimpanzee adenovirus vaccination in humans. This work highlights the value of a prime-target approach for immunization against malaria and suggests that this strategy may represent a more general approach for prophylaxis or immunotherapy of other liver infections and diseases. Immunogenicity of T cell-inducing vaccines, such as viral vectors or DNA vaccines and Bacillus Calmette-Guérin (BCG), are frequently assessed by cytokine-based approaches. While these are sensitive methods that have shown correlates of protection in various vaccine studies, they only identify a small proportion of the vaccine-specific T cell response. Responses to vaccination are likely to be heterogeneous, particularly when comparing prime and boost or assessing vaccine performance across diverse populations. Activation-induced markers (AIM) can provide a broader view of the total antigen-specific T cell response to enable a more comprehensive evaluation of vaccine immunogenicity. We tested an AIM assay for the detection of vaccine-specific CD4⁺ and CD8⁺ T cell responses in healthy UK adults vaccinated with viral vectored Ebola vaccine candidates, ChAd3-EBO-Z and MVA-EBO-Z. We used the markers, CD25, CD134 (OX40), CD274 (PDL1), and CD107a, to sensitively identify vaccine-responsive T cells. We compared the use of OX40⁺CD25⁺ and OX40⁺PDL1⁺ in CD4⁺ T cells and OX40⁺CD25⁺ and CD25⁺CD107a⁺ in CD8⁺ T cells for their sensitivity, specificity, and associations with other measures of vaccine immunogenicity. We show that activation-induced markers can be used as an additional method of demonstrating vaccine immunogenicity, providing a broader picture of the global T cell response to vaccination. A malaria vaccine strategy targeting multiple lifecycle stages may be required to achieve a high level of efficacy. In two Phase IIa clinical trials, we tested immunogenicity and efficacy of RTS,S/AS01B administered alone, in a staggered regimen with viral-vectored vaccines or co-administered with viral-vectored vaccines. RTS,S/AS01B induces high titers of antibody against sporozoites and viral-vectored vaccines ChAd63 ME-TRAP and MVA ME-TRAP induce potent T cell responses against infected hepatocytes. By combining these two strategies, we aimed to improve efficacy by inducing immune responses targeting multiple parasite antigens. Vaccination with RTS,S/AS01B alone or in a staggered regimen with viral vectors produced strong immune responses and demonstrated high levels of protection against controlled human malaria infection. However, concomitant administration of these vaccines significantly reduced humoral immunogenicity and protective efficacy. Strong Th1-biased cytokine responses induced by MVA ME-TRAP were associated with a skew in circulating T follicular helper cells toward a CXCR3+ phenotype and a reduction in antibody quantity and quality. This study illustrates that while a multistage-targeting vaccine strategy could provide high-level efficacy, the regimen design will require careful optimization. The development of effective vaccines continues to be a key goal for public health bodies, governments, funding bodies and pharmaceutical companies. With new vaccines such as Shingrix targeting Shingles and Bexsero for Meningitis B, licensed in recent years, today's population can be protected from more infectious diseases than ever before. Despite this, we are yet to license vaccines for some of the deadliest endemic diseases affecting children, such as malaria. In addition, the threat of epidemics caused by emerging pathogens is very real as exemplified by the 2014⁻2016 Ebola outbreak. Most licensed vaccines provide efficacy through humoral immunity and correlates of protection often quantify neutralising antibody titre. The role of T-cells in vaccine efficacy is less well understood and more complex to quantify. Defining T-cell responses which afford protection also remains a challenge, although more sophisticated assays for assessing cell-mediated immunity with the potential for higher throughput and scalability are now available and warrant review. Here we discuss the benefits of multiparameter cytokine analysis and omics approaches compared with flow cytometric and ELISpot assays. We also review technical challenges unique to clinical trial studies, including assay validation across laboratories and availability of sample type. Measuring T-cell immunogenicity alongside humoral responses provides information on the breadth of immune responses induced by vaccination. Accurately enumerating and phenotyping T-cell immunogenicity to vaccination is key for the determination of immune correlates of protection. However, identifying such T-cell parameters remains challenging without a clear understanding of the immunological mechanisms by which a T-cell-mediated response induces protection. Ab avidity is a measure of the overall strength of Ab-Ag interactions and hence is important for understanding the functional efficiency of Abs. In vaccine evaluations, Ab avidity measurements can provide insights into immune correlates of protection and generate hypotheses regarding mechanisms of protection to improve vaccine design to achieve higher levels of efficacy. The commonly used Ab avidity assays require the use of chaotropic reagents to measure avidity index. In this study, using real-time detection of Ab-Ag binding by biolayer interferometry (BLI) technique, we have developed a qualified assay for measuring avidity of vaccine-induced Abs specific for Plasmodium falciparum circumsporozoite protein (CSP) Ags. Human mAb derived from plasmablasts of recipients of RTS,S/AS01 (RTS,S), the most advanced malaria vaccine candidate, were used in the assay development to measure Ag-specific binding responses and rate constants of association and dissociation. The optimized BLI binding assay demonstrated 1) good precision (percentage of coefficient of variation <20), 2) high specificity, 3) a lower limit of detection and quantitation in the 0.3-3.3 nM range, and 4) a range of linearity up to 50-100 nM for the CSP Ags tested. Analysis of polyclonal sera of malaria vaccinees demonstrated the suitability of this method to distinguish among vaccinees and rank Ab responses by avidity. These results demonstrate that precise, specific, and sensitive BLI measurements of Ab avidity in polyclonal sera from malaria vaccinees can map Ab response heterogeneity and potentially help to determine the role of Ab avidity as an immune correlate of protection for vaccines. Heterologous prime-boost vaccination with viral vectors simian adenovirus 63 (ChAd63) and Modified Vaccinia Ankara (MVA) induces potent T cell and antibody responses in humans. The 8-week regimen demonstrates significant efficacy against malaria when expressing the pre-erythrocytic malaria antigen Thrombospondin-Related Adhesion Protein fused to a multiple epitope string (ME-TRAP). We tested these vaccines in 7 new 4- and 8- week interval schedules to evaluate safety and immunogenicity of multiple ChAd63 ME-TRAP priming vaccinations (denoted A), multiple MVA ME-TRAP boosts (denoted M) and alternating vectors. All regimens exhibited acceptable reactogenicity and CD8+ T cell immunogenicity was enhanced with a 4-week interval (AM) and with incorporation of additional ChAd63 ME-TRAP vaccination at 4- or 8-weeks (AAM or A_A_M). Induction of TRAP antibodies was comparable between schedules. T cell immunity against the ChAd63 hexon did not affect T cell responses to the vaccine insert, however pre-vaccination ChAd63-specific T cells correlated with reduced TRAP antibodies. Vaccine-induced antibodies against MVA did not affect TRAP antibody induction, and correlated positively with ME-TRAP-specific T cells. This study identifies potentially more effective immunisation regimens to assess in Phase IIa trials and demonstrates a degree of flexibility with the timing of vectored vaccine administration, aiding incorporation into existing vaccination programmes. A large research effort is currently underway to find an effective and affordable malaria vaccine. Tools that enable the rapid evaluation of protective immune responses are essential to vaccine development as they can provide selection criteria to rank order vaccine candidates. In this study we have revisited the Inhibition of Sporozoite Invasion (ISI) assay to assess the ability of antibodies to inhibit sporozoite infection of hepatocytes. By using GFP expressing sporozoites of the rodent parasite P. berghei we are able to robustly quantify parasite infection of hepatocyte cell lines by flow cytometry. In conjunction with recently produced transgenic P. berghei parasites that express P. falciparum sporozoite antigens, we have been able to use this assay to measure antibody mediated inhibition of sporozoite invasion against one of the lead malaria antigens P. falciparum CSP. By combining chimeric rodent parasites expressing P. falciparum antigens and a flow cytometric readout of infection, we are able to robustly assess vaccine-induced antibodies, from mice, rhesus macaques and human clinical trials, for their functional ability to block sporozoite invasion of hepatocytes. Background: Heterologous prime-boost vaccination with chimpanzee adenovirus 63 (ChAd63) and modified vaccinia virus Ankara (MVA) encoding multiple epitope string thrombospondin-related adhesion protein (ME-TRAP) has shown acceptable safety and promising immunogenicity in African adult and pediatric populations. If licensed, this vaccine could be given to infants receiving routine childhood immunizations. We therefore evaluated responses to ChAd63 MVA ME-TRAP when co-administered with routine Expanded Program on Immunization (EPI) vaccines. Methods: We enrolled 65 Gambian infants and neonates, aged 16, 8, or 1 week at first vaccination and randomized them to receive either ME-TRAP and EPI vaccines or EPI vaccines only. Safety was assessed by the description of vaccine-related adverse events (AEs). Immunogenicity was evaluated using IFNγ enzyme-linked immunospot, whole-blood flow cytometry, and anti-TRAP IgG ELISA. Serology was performed to confirm all infants achieved protective titers to EPI vaccines. Results: The vaccines were well tolerated in all age groups with no vaccine-related serious AEs. High-level TRAP-specific IgG and T cell responses were generated after boosting with MVA. CD8+ T cell responses, previously found to correlate with protection, were induced in all groups. Antibody responses to EPI vaccines were not altered significantly. Conclusion: Malaria vectored prime-boost vaccines co-administered with routine childhood immunizations were well tolerated. Potent humoral and cellular immunity induced by ChAd63 MVA ME-TRAP did not reduce the immunogenicity of co-administered EPI vaccines, supporting further evaluation of this regimen in infant populations. Clinical Trial Registration: The clinical trial was registered on http://Clinicaltrials.gov (NCT02083887) and the Pan-African Clinical Trials Registry (PACTR201402000749217). The use of viral vectors in heterologous prime-boost regimens to induce potent T cell responses in addition to humoral immunity is a promising vaccination strategy in the fight against malaria. We conducted an open-label, first-in-human, controlled Phase I study evaluating the safety and immunogenicity of Matrix-M adjuvanted vaccination with a chimpanzee adenovirus serotype 63 (ChAd63) prime followed by a modified vaccinia Ankara (MVA) boost eight weeks later, both encoding the malaria ME-TRAP antigenic sequence (a multiple epitope string fused to thrombospondin-related adhesion protein). Twenty-two healthy adults were vaccinated intramuscularly with either ChAd63-MVA ME-TRAP alone (n=6) or adjuvanted with 25μg (n=8) or 50μg (n=8) Matrix-M. Vaccinations appeared to be safe and generally well tolerated, with the majority of local and systemic adverse events being mild in nature. The addition of Matrix-M to the vaccine did not increase local reactogenicity; however, systemic adverse events were reported more frequently by volunteers who received adjuvanted vaccine in comparison to the control group. T cell ELISpot responses peaked at 7-days post boost vaccination with MVA ME-TRAP in all three groups. TRAP-specific IgG responses were highest at 28-days post boost with MVA ME-TRAP in all three groups. There were no differences in cellular and humoral immunogenicity at any of the time points between the control group and the adjuvanted groups. We demonstrate that Matrix-M can be safely used in combination with ChAd63-MVA ME-TRAP heterologous prime-boost immunization without any reduction in cellular or humoral immunogenicity. Clinical Trials Registration NCT01669512. Sporadic outbreaks of Ebola virus infection have been documented since the mid-Seventies and viral exposure can lead to lethal haemorrhagic fever with case fatalities as high as 90%. There is now a comprehensive body of data from both ongoing and completed clinical trials assessing various vaccine strategies, which were rapidly advanced through clinical trials in response to the 2013-2016 Ebola virus disease (EVD) public health emergency. Careful consideration of immunogenicity post vaccination is essential but has been somewhat stifled because of the wide array of immunological assays and outputs that have been used in the numerous clinical trials. We discuss here the different aspects of the immune assays currently used in the Phase I clinical trials for Ebola virus vaccines, and draw comparisons across the immune outputs where possible; various trials have examined both cellular and humoral immunity in European and African cohorts. Assessment of the safety data, the immunological outputs and the ease of field deployment for the various vaccine modalities will help both the scientific community and policy-makers prioritize and potentially license vaccine candidates. If this can be achieved, the next outbreak of Ebola virus, or other emerging pathogen, can be more readily contained and will not have such widespread and devastating consequences.This article is part of the themed issue 'The 2013-2016 West African Ebola epidemic: data, decision-making and disease control'. Ex vivo functional immunoassays such as ELISpot and intracellular cytokine staining (ICS) by flow cytometry are crucial tools in vaccine development both in the identification of novel immunogenic targets and in the immunological assessment of samples from clinical trials. Cryopreservation and subsequent thawing of PBMCs via validated processes has become a mainstay of clinical trials due to processing restrictions inherent in the disparate location and capacity of trial centres, and also in the need to standardize biological assays at central testing facilities. Logistical and financial requirement to batch process samples from multiple study timepoints are also key. We used ELISpot and ICS assays to assess antigen-specific immunogenicity in blood samples taken from subjects enrolled in a phase II malaria heterologous prime-boost vaccine trial and showed that the freeze thaw process can result in a 3-5-fold reduction of malaria antigen-specific IFNγ-producing CD3+CD4+ effector populations from PBMC samples taken post vaccination. We have also demonstrated that peptide responsive CD8+ T cells are relatively unaffected, as well as CD4+ T cell populations that do not produce IFNγ. These findings contribute to a growing body of data that could be consolidated and synthesised as guidelines for clinical trials with the aim of increasing the efficiency of vaccine development pipelines. Efforts are under way to improve the efficacy of subunit malaria vaccines through assessments of new adjuvants, vaccination platforms, and antigens. In this study, we further assessed the Plasmodium falciparum antigen upregulated in infective sporozoites 3 (PfUIS3) as a vaccine candidate. PfUIS3 was expressed in the viral vectors chimpanzee adenovirus 63 (ChAd63) and modified vaccinia virus Ankara (MVA) and used to immunize mice in a prime-boost regimen. We previously demonstrated that this regimen could provide partial protection against challenge with chimeric P. berghei parasites expressing PfUIS3. We now show that ChAd63-MVA PfUIS3 can also provide partial cross-species protection against challenge with wild-type P. berghei parasites. We also show that PfUIS3-specific cellular memory responses could be recalled in human volunteers exposed to P. falciparum parasites in a controlled human malaria infection study. When ChAd63-MVA PfUIS3 was coadministered with the vaccine candidate P. falciparum thrombospondin-related adhesion protein (PfTRAP) expressed in the ChAd63-MVA system, there was no significant change in immunogenicity to either vaccine. However, when mice were challenged with double chimeric P. berghei-P. falciparum parasites expressing both PfUIS3 and PfTRAP, vaccine efficacy was improved to 100% sterile protection. This synergistic effect was evident only when the two vaccines were mixed and administered at the same site. We have therefore demonstrated that vaccination with PfUIS3 can induce a consistent delay in patent parasitemia across mouse strains and against chimeric parasites expressing PfUIS3 as well as wild-type P. berghei; when this vaccine is combined with another partially protective regimen (ChAd63-MVA PfTRAP), complete protection is induced. Heterologous prime-boosting with viral vectors encoding the pre-erythrocytic antigen thrombospondin-related adhesion protein fused to a multiple epitope string (ME-TRAP) induces CD8+ T cell-mediated immunity to malaria sporozoite challenge in European malaria-naive and Kenyan semi-immune adults. This approach has yet to be evaluated in children and infants. We assessed this vaccine strategy among 138 Gambian and Burkinabe children in four cohorts: 2- to 6-year olds in The Gambia, 5- to 17-month-olds in Burkina Faso, and 5- to 12-month-olds and 10-week-olds in The Gambia. We assessed induction of cellular immunity, taking into account the distinctive hematological status of young infants, and characterized the antibody response to vaccination. T cell responses peaked 7 days after boosting with modified vaccinia virus Ankara (MVA), with highest responses in infants aged 10 weeks at priming. Incorporating lymphocyte count into the calculation of T cell responses facilitated a more physiologically relevant comparison of cellular immunity across different age groups. Both CD8+ and CD4+ T cells secreted cytokines. Induced antibodies were up to 20-fold higher in all groups compared with Gambian and United Kingdom (UK) adults, with comparable or higher avidity. This immunization regimen elicited strong immune responses, particularly in young infants, supporting future evaluation of efficacy in this key target age group for a malaria vaccine. Malaria transmission is in decline in some parts of Africa, partly due to the scaling up of control measures. If the goal of elimination is to be achieved, additional control measures including an effective and durable vaccine will be required. Studies utilising the prime-boost approach to deliver viral vectors encoding the pre-erythrocytic antigen ME-TRAP (multiple epitope thrombospondin-related adhesion protein) have shown promising safety, immunogenicity and efficacy in sporozoite challenge studies. More recently, a study in Kenyan adults, similar to that reported here, showed substantial efficacy against P. falciparum infection. One hundred and twenty healthy male volunteers, living in a malaria endemic area of Senegal were randomised to receive either the Chimpanzee adenovirus (ChAd63) ME-TRAP as prime vaccination, followed eight weeks later by modified vaccinia Ankara (MVA) also encoding ME-TRAP as booster, or two doses of anti-rabies vaccine as a comparator. Prior to follow-up, antimalarials were administered to clear parasitaemia and then participants were monitored by PCR for malaria infection for eight weeks. The primary endpoint was time-to-infection with P. falciparum malaria, determined by two consecutive positive PCR results. Secondary endpoints included adverse event reporting, measures of cellular and humoral immunogenicity and a meta-analysis of combined vaccine efficacy with the parallel study in Kenyan adults.We show that this pre-erythrocytic malaria vaccine is safe and induces significant immunogenicity, with a peak T-cell response at seven days after boosting of 932 Spot Forming Cells (SFC)/106 Peripheral Blood Mononuclear Cells(PBMC) compared to 57 SFC/ 106 PBMCs in the control group. However, a vaccine efficacy was not observed: 12 of 57 ME-TRAP vaccinees became PCR positive during the intensive monitoring period as compared to 13 of the 58 controls (P = 0.80). This trial confirms that vaccine efficacy against malaria infection in adults may be rapidly assessed using this efficient and cost-effective clinical trial design. Further efficacy evaluation of this vectored candidate vaccine approach in other malaria transmission settings and age-de-escalation into the main target age groups for a malaria vaccine is in progress. BACKGROUND: The need for a highly efficacious vaccine against Plasmodium falciparum remains pressing. In this controlled human malaria infection (CHMI) study, we assessed the safety, efficacy and immunogenicity of a schedule combining 2 distinct vaccine types in a staggered immunization regimen: one inducing high-titer antibodies to circumsporozoite protein (RTS,S/AS01B) and the other inducing potent T-cell responses to thrombospondin-related adhesion protein (TRAP) by using a viral vector. METHOD: Thirty-seven healthy malaria-naive adults were vaccinated with either a chimpanzee adenovirus 63 and modified vaccinia virus Ankara-vectored vaccine expressing a multiepitope string fused to TRAP and 3 doses of RTS,S/AS01B (group 1; n = 20) or 3 doses of RTS,S/AS01B alone (group 2; n = 17). CHMI was delivered by mosquito bites to 33 vaccinated subjects at week 12 after the first vaccination and to 6 unvaccinated controls. RESULTS: No suspected unexpected serious adverse reactions or severe adverse events related to vaccination were reported. Protective vaccine efficacy was observed in 14 of 17 subjects (82.4%) in group 1 and 12 of 16 subjects (75%) in group 2. All control subjects received a diagnosis of blood-stage malaria parasite infection. Both vaccination regimens were immunogenic. Fourteen protected subjects underwent repeat CHMI 6 months after initial CHMI; 7 of 8 (87.5%) in group 1 and 5 of 6 (83.3%) in group 2 remained protected. CONCLUSIONS: The high level of sterile efficacy observed in this trial is encouraging for further evaluation of combination approaches using these vaccine types. CLINICAL TRIALS REGISTRATION: NCT01883609. Malaria remains a significant global health burden and a vaccine would make a substantial contribution to malaria control. Chimpanzee Adenovirus 63 Modified Vaccinia Ankara Multiple epitope thrombospondin adhesion protein (ME-TRAP) and vaccination has shown significant efficacy against malaria sporozoite challenge in malaria-naive European volunteers and against malaria infection in Kenyan adults. Infants are the target age group for malaria vaccination; however, no studies have yet assessed T-cell responses in children and infants. We enrolled 138 Gambian and Burkinabe children in four different age-groups: 2-6 years old in The Gambia; 5-17 months old in Burkina Faso; 5-12 months old, and also 10 weeks old, in The Gambia; and evaluated the safety and immunogenicity of Chimpanzee Adenovirus 63 Modified Vaccinia Ankara ME-TRAP heterologous prime-boost immunization. The vaccines were well tolerated in all age groups with no vaccine-related serious adverse events. T-cell responses to vaccination peaked 7 days after boosting with Modified Vaccinia Ankara, with T-cell responses highest in 10 week-old infants. Heterologous prime-boost immunization with Chimpanzee Adenovirus 63 and Modified Vaccinia Ankara ME-TRAP was well tolerated in infants and children, inducing strong T-cell responses. We identify an approach that induces potent T-cell responses in infants, which may be useful for preventing other infectious diseases requiring cellular immunity. Viral vectors are the vaccine platform of choice for many pathogens that have thwarted efforts towards control using conventional vaccine approaches. Although the STEP trial encumbered development of recombinant human adenovirus vectors only a few years ago, replication-deficient simian adenoviruses have since emerged as a crucial component of clinically effective prime-boost regimens. The vectors discussed here elicit functionally relevant cellular and humoral immune responses, at extremes of age and in diverse populations. The recent Ebola virus outbreak highlighted the utility of viral vectored vaccines in facilitating a rapid response to public health emergencies. Meanwhile, technological advances in manufacturing to support scale-up of viral vectored vaccines have helped to consolidate their position as a leading approach to tackling 'old' and emerging infections. BACKGROUND: The West African outbreak of Ebola virus disease that peaked in 2014 has caused more than 11,000 deaths. The development of an effective Ebola vaccine is a priority for control of a future outbreak. METHODS: In this phase 1 study, we administered a single dose of the chimpanzee adenovirus 3 (ChAd3) vaccine encoding the surface glycoprotein of Zaire ebolavirus (ZEBOV) to 60 healthy adult volunteers in Oxford, United Kingdom. The vaccine was administered in three dose levels--1×10(10) viral particles, 2.5×10(10) viral particles, and 5×10(10) viral particles--with 20 participants in each group. We then assessed the effect of adding a booster dose of a modified vaccinia Ankara (MVA) strain, encoding the same Ebola virus glycoprotein, in 30 of the 60 participants and evaluated a reduced prime-boost interval in another 16 participants. We also compared antibody responses to inactivated whole Ebola virus virions and neutralizing antibody activity with those observed in phase 1 studies of a recombinant vesicular stomatitis virus-based vaccine expressing a ZEBOV glycoprotein (rVSV-ZEBOV) to determine relative potency and assess durability. RESULTS: No safety concerns were identified at any of the dose levels studied. Four weeks after immunization with the ChAd3 vaccine, ZEBOV-specific antibody responses were similar to those induced by rVSV-ZEBOV vaccination, with a geometric mean titer of 752 and 921, respectively. ZEBOV neutralization activity was also similar with the two vaccines (geometric mean titer, 14.9 and 22.2, respectively). Boosting with the MVA vector increased virus-specific antibodies by a factor of 12 (geometric mean titer, 9007) and increased glycoprotein-specific CD8+ T cells by a factor of 5. Significant increases in neutralizing antibodies were seen after boosting in all 30 participants (geometric mean titer, 139; P<0.001). Virus-specific antibody responses in participants primed with ChAd3 remained positive 6 months after vaccination (geometric mean titer, 758) but were significantly higher in those who had received the MVA booster (geometric mean titer, 1750; P<0.001). CONCLUSIONS: The ChAd3 vaccine boosted with MVA elicited B-cell and T-cell immune responses to ZEBOV that were superior to those induced by the ChAd3 vaccine alone. (Funded by the Wellcome Trust and others; ClinicalTrials.gov number, NCT02240875.). IMPORTANCE: Developing effective vaccines against Ebola virus is a global priority. OBJECTIVE: To evaluate an adenovirus type 26 vector vaccine encoding Ebola glycoprotein (Ad26.ZEBOV) and a modified vaccinia Ankara vector vaccine, encoding glycoproteins from Ebola virus, Sudan virus, Marburg virus, and Tai Forest virus nucleoprotein (MVA-BN-Filo). DESIGN, SETTING, AND PARTICIPANTS: Single-center, randomized, placebo-controlled, observer-blind, phase 1 trial performed in Oxford, United Kingdom, enrolling healthy 18- to 50-year-olds from December 2014; 8-month follow-up was completed October 2015. INTERVENTIONS: Participants were randomized into 4 groups, within which they were simultaneously randomized 5:1 to receive study vaccines or placebo. Those receiving active vaccines were primed with Ad26.ZEBOV (5 × 10(10) viral particles) or MVA-BN-Filo (1 × 10(8) median tissue culture infective dose) and boosted with the alternative vaccine 28 or 56 days later. A fifth, open-label group received Ad26.ZEBOV boosted by MVA-BN-Filo 14 days later. MAIN OUTCOMES AND MEASURES: The primary outcomes were safety and tolerability. All adverse events were recorded until 21 days after each immunization; serious adverse events were recorded throughout the trial. Secondary outcomes were humoral and cellular immune responses to immunization, as assessed by enzyme-linked immunosorbent assay and enzyme-linked immunospot performed at baseline and from 7 days after each immunization until 8 months after priming immunizations. RESULTS: Among 87 study participants (median age, 38.5 years; 66.7% female), 72 were randomized into 4 groups of 18, and 15 were included in the open-label group. Four participants did not receive a booster dose; 67 of 75 study vaccine recipients were followed up at 8 months. No vaccine-related serious adverse events occurred. No participant became febrile after MVA-BN-Filo, compared with 3 of 60 participants (5%; 95% CI, 1%-14%) receiving Ad26.ZEBOV in the randomized groups. In the open-label group, 4 of 15 Ad26.ZEBOV recipients (27%; 95% CI, 8%-55%) experienced fever. In the randomized groups, 28 of 29 Ad26.ZEBOV recipients (97%; 95% CI, 82%- 99.9%) and 7 of 30 MVA-BN-Filo recipients (23%; 95% CI, 10%-42%) had detectable Ebola glycoprotein-specific IgG 28 days after primary immunization. All vaccine recipients had specific IgG detectable 21 days postboost and at 8-month follow-up. Within randomized groups, at 7 days postboost, at least 86% of vaccine recipients showed Ebola-specific T-cell responses. CONCLUSIONS AND RELEVANCE: In this phase 1 study of healthy volunteers, immunization with Ad26.ZEBOV or MVA-BN-Filo did not result in any vaccine-related serious adverse events. An immune response was observed after primary immunization with Ad26.ZEBOV; boosting by MVA-BN-Filo resulted in sustained elevation of specific immunity. These vaccines are being further assessed in phase 2 and 3 studies. TRIAL REGISTRATION: clinicaltrials.gov Identifier: NCT02313077. Blood sampling to assess production of antigen-specific antibodies after immunization is commonly performed, but it presents logistical difficulties for trials carried out during an infectious disease outbreak. In this study, we show that antibodies may be reliably detected in oral fluid collected in a minimally invasive manner without use of sharps. Clinical Trials Registration. NCT02240875. Malaria, caused by the Plasmodium parasite, remains a serious global public health concern. A vaccine could have a substantial impact on eliminating this disease, alongside other preventative measures. We recently described the development of three novel, viral vectored vaccines expressing either of the antigens PfUIS3, PfLSA1 and PfLSAP2. Each vaccination regimen provided high levels of protection against chimeric parasite challenge in a mouse model, largely dependent on CD8+ T cells. In this study we aimed to further characterize the induced cellular immune response to these vaccines. We utilized both the IFNγ enzyme-linked immunosorbent spot assay and intracellular cytokine staining to achieve this aim. We identified immunodominant peptide responses for CD4+ and CD8+ T cells for each of the antigens in BALB/c, C57BL/6 and HLA-A2 transgenic mice, creating a useful tool for researchers for subsequent study of these antigens. We also compared these immunodominant peptides with those generated from epitope prediction software, and found that only a small proportion of the large number of epitopes predicted by the software were identifiable experimentally. Furthermore, we characterized the polyfunctionality of the induced CD8+ T cell responses. These findings contribute to our understanding of the immunological mechanisms underlying these protective vaccines, and provide a useful basis for the assessment of these and related vaccines as clinical constructs. Viral vectors used in heterologous prime-boost regimens are one of very few vaccination approaches that have yielded significant protection against controlled human malaria infections. Recently, protection induced by chimpanzee adenovirus priming and modified vaccinia Ankara boosting using the ME-TRAP insert has been correlated with the induction of potent CD8(+) T cell responses. This regimen has progressed to field studies where efficacy against infection has now been reported. The same vectors have been used pre-clinically to identify preferred protective antigens for use in vaccines against the pre-erythrocytic, blood-stage and mosquito stages of malaria and this work is reviewed here for the first time. Such antigen screening has led to the prioritization of the PfRH5 blood-stage antigen, which showed efficacy against heterologous strain challenge in non-human primates, and vectors encoding this antigen are in clinical trials. This, along with the high transmission-blocking activity of some sexual-stage antigens, illustrates well the capacity of such vectors to induce high titre protective antibodies in addition to potent T cell responses. All of the protective responses induced by these vectors exceed the levels of the same immune responses induced by natural exposure supporting the view that, for subunit vaccines to achieve even partial efficacy in humans, "unnatural immunity" comprising immune responses of very high magnitude will need to be induced. Afolabi MO, Mensah V, Kanteh E, Ndaw A, Roetynck S, Clarke E, Faye B, Imoukhuede EB, Lawrie A, Roberts R, Jagne YJ, Leroy O, Viebig N, D'Alessio F, Kampmann B, Ewer K, Hill AV, Cisse B, Bojang K et al. 2015. HETEROLOGOUS PRIME-BOOST VACCINATION WITH CANDIDATE MALARIA VACCINES CHAD63-MVA ME-TRAP IS SAFE AND HIGHLY IMMUNOGENIC FOR EFFECTOR T-CELL INDUCTION WHEN CO-ADMINISTERED WITH EPI VACCINES IN HEALTHY GAMBIAN INFANTS AND NEONATES	AMERICAN JOURNAL OF TROPICAL MEDICINE AND HYGIENE,	93	(4),	pp. 110-110. Rampling T, Bowyer G, Wright D, Venkatraman N, Payne R, Sridhar S, Edwards N, Poulton I, Imoukhuede EB, Vekemans J, Sinden R, Roberts R, Weltzin R, Morelle D, Yassin-Rajkumar B, Birkett AJ, Ivinson KL, Ockenhouse CF, Wille-Reece U, Lee CK, Faust S, Cooke G, Lewis D, Lawrie A, Ballou WR, Ewer K, Hill A et al. 2015. SAFETY, IMMUNOGENICITY AND EFFICACY OF THE COMBINATION MALARIA VACCINE REGIMEN OF RTS, S/AS01B CONCOMITANTLY ADMINISTERED WITH CHAD-MVA VIRAL VECTORS EXPRESSING ME-TRAP	AMERICAN JOURNAL OF TROPICAL MEDICINE AND HYGIENE,	93	(4),	pp. 391-391. The development of an efficacious Plasmodium falciparum malaria vaccine remains a top priority for global health. Vaccination with irradiated sporozoites is able to provide complete sterile protection through the action of CD8(+) T cells at the liver-stage of infection. However, this method is currently unsuitable for large-scale deployment and focus has instead turned to the development of sub-unit vaccines. Sub-unit vaccine efforts have traditionally focused on two well-known pre-erythrocytic antigens, CSP and TRAP, yet thousands of genes are expressed in the liver-stage. We sought to assess the ability of eight alternative P. falciparum pre-erythrocytic antigens to induce a high proportion of CD8(+) T cells. We show that all antigens, when expressed individually in the non-replicating viral vectors ChAd63 and MVA, are capable of inducing an immune response in mice. Furthermore, we also developed chimeric P. berghei parasites expressing the cognate P. falciparum antigen to enable assessment of efficacy in mice. Our preliminary results indicate that vectors encoding either PfLSA1 or PfLSAP2 are capable of inducing sterile protection dependent on the presence of CD8(+) T cells. This work has identified two promising P. falciparum liver-stage candidate antigens that will now undergo further testing in humans. The development of an efficacious vaccine against the Plasmodium parasite remains a top priority. Previous research has demonstrated the ability of a prime-boost virally vectored sub-unit vaccination regimen, delivering the liver-stage expressed malaria antigen TRAP, to produce high levels of antigen-specific T cells. The liver-stage of malaria is the main target of T cell-mediated immunity, yet a major challenge in assessing new T cell inducing vaccines has been the lack of a suitable pre-clinical assay. We have developed a flow-cytometry based in vitro T cell killing assay using a mouse hepatoma cell line, Hepa1-6, and Plasmodium berghei GFP expressing sporozoites. Using this assay, P. berghei TRAP-specific CD8+ T cell enriched splenocytes were shown to inhibit liver-stage parasites in an effector-to-target ratio dependent manner. Further development of this assay using human hepatocytes and P. falciparum would provide a new method to pre-clinically screen vaccine candidates and to elucidate mechanisms of protection in vitro. BACKGROUND: Plasmodium falciparum (P. falciparum) malaria remains a significant cause of mortality and morbidity throughout the world. Development of an effective vaccine would be a key intervention to reduce the considerable social and economic impact of malaria. METHODOLOGY: We conducted a Phase Ia, non-randomized, clinical trial in 24 healthy, malaria-naïve adults of the chimpanzee adenovirus 63 (ChAd63) and modified vaccinia virus Ankara (MVA) replication-deficient viral vectored vaccines encoding the circumsporozoite protein (CS) of P. falciparum. RESULTS: ChAd63-MVA CS administered in a heterologous prime-boost regime was shown to be safe and immunogenic, inducing high-level T cell responses to CS. With a priming ChAd63 CS dose of 5×109 vp responses peaked at a mean of 1947 SFC/million PBMC (median 1524) measured by ELIspot 7 days after the MVA boost and showed a mixed CD4+/CD8+ phenotype. With a higher priming dose of ChAd63 CS dose 5×1010 vp T cell responses did not increase (mean 1659 SFC/million PBMC, median 1049). Serum IgG responses to CS were modest and peaked at day 14 post ChAd63 CS (median antibody concentration for all groups at day 14 of 1.3 µg/ml (range 0-11.9), but persisted throughout late follow-up (day 140 median antibody concentration groups 1B & 2B 0.9 µg/ml (range 0-4.7). CONCLUSIONS: ChAd63-MVA is a safe and highly immunogenic delivery platform for the CS antigen in humans which warrants efficacy testing. TRIAL REGISTRATION: ClinicalTrials.gov NCT01450280. Bliss CM, Spencer AJ, Salman AM, Longley RJ, Galan AR, Khan SM, Janse CJ, O'Shea MK, Hill AV, Ewer KJ. 2014. Development of an in vitro Plasmodium parasite killing assay for the evaluation of cell-mediated immune responses following vaccination with pre-erythrocytic malaria vaccine candidates	IMMUNOLOGY,	143	pp. 74-75. The development of protective vaccines against many difficult infectious pathogens will necessitate the induction of effective antibody responses. Here we assess humoral immune responses against two antigens from the blood-stage merozoite of the Plasmodium falciparum human malaria parasite--MSP1 and AMA1. These antigens were delivered to healthy malaria-naïve adult volunteers in Phase Ia clinical trials using recombinant replication-deficient viral vectors--ChAd63 to prime the immune response and MVA to boost. In subsequent Phase IIa clinical trials, immunized volunteers underwent controlled human malaria infection (CHMI) with P. falciparum to assess vaccine efficacy, whereby all but one volunteer developed low-density blood-stage parasitemia. Here we assess serum antibody responses against both the MSP1 and AMA1 antigens following i) ChAd63-MVA immunization, ii) immunization and CHMI, and iii) primary malaria exposure in the context of CHMI in unimmunized control volunteers. Responses were also assessed in a cohort of naturally-immune Kenyan adults to provide comparison with those induced by a lifetime of natural malaria exposure. Serum antibody responses against MSP1 and AMA1 were characterized in terms of i) total IgG responses before and after CHMI, ii) responses to allelic variants of MSP1 and AMA1, iii) functional growth inhibitory activity (GIA), iv) IgG avidity, and v) isotype responses (IgG1-4, IgA and IgM). These data provide the first in-depth assessment of the quality of adenovirus-MVA vaccine-induced antibody responses in humans, along with assessment of how these responses are modulated by subsequent low-density parasite exposure. Notable differences were observed in qualitative aspects of the human antibody responses against these malaria antigens depending on the means of their induction and/or exposure of the host to the malaria parasite. Given the continued clinical development of viral vectored vaccines for malaria and a range of other diseases targets, these data should help to guide further immuno-monitoring studies of vaccine-induced human antibody responses. To induce a deployable level of efficacy, a successful malaria vaccine would likely benefit from both potent cellular and humoral immunity. These requirements are met by a heterologous prime-boost immunization strategy employing a chimpanzee adenovirus vector followed by modified vaccinia Ankara (MVA), both encoding the pre-erythrocytic malaria antigen ME-thrombospondin-related adhesive protein (TRAP), with high immunogenicity and significant efficacy in UK adults. We undertook two phase 1b open-label studies in adults in Kenya and The Gambia in areas of similar seasonal malaria transmission dynamics and have previously reported safety and basic immunogenicity data. We now report flow cytometry and additional interferon (IFN)-γ enzyme-linked immunospot (ELISPOT) data characterizing pre-existing and induced cellular immunity as well as anti-TRAP IgG responses. T-cell responses induced by vaccination averaged 1,254 spot-forming cells (SFC) per million peripheral blood mononuclear cells (PBMC) across both trials and flow cytometry revealed cytokine production from both CD4(+) and CD8(+) T cells with the frequency of CD8(+) IFN-γ-secreting monofunctional T cells (previously shown to associate with vaccine efficacy) particularly high in Kenyan adults. Immunization with ChAd63 and MVA ME-TRAP induced strong cellular and humoral immune responses in adults living in two malaria-endemic regions of Africa. This prime-boost approach targeting the pre-erythrocytic stage of the malaria life-cycle is now being assessed for efficacy in a target population. Prior to a chimpanzee adenovirus-based (ChAd63) malarial vaccine trial, sera were collected to assess ChAd63-specific neutralizing antibody titers in Banfora (Burkina Faso). The low neutralizing antibody titers reported in both adults and children (median titers, 139.1 and 35.0, respectively) are encouraging for the potential use of ChAd63 as a malarial vaccine vector. Acquisition of non-sterilizing natural immunity to Plasmodium falciparum malaria has been shown in low transmission areas following multiple exposures. However, conflicting data from endemic areas suggest that the parasite may interfere with the induction of effective B-cell responses. To date, the impact of blood-stage parasite exposure on antigen-specific B cells has not been reported following controlled human malaria infection (CHMI). Here we analysed human B-cell responses in a series of Phase I/IIa clinical trials, which include CHMI, using candidate virus-vectored vaccines encoding two blood-stage antigens: merozoite surface protein 1 (MSP1) and apical membrane antigen 1 (AMA1). Previously vaccinated volunteers show boosting of pre-existing antigen-specific memory B-cell (mBC) responses following CHMI. In contrast, unvaccinated malaria-naive control volunteers developed an mBC response against MSP1 but not AMA1. Serum IgG correlated with the mBC response after booster vaccination but this relationship was less well maintained following CHMI. A significant reduction in peripheral MSP1-specific mBC was observed at the point of diagnosis of blood-stage infection. This was coincident with a reduction in peripheral blood B-cell subsets expressing CXCR3 and elevated serum levels of interferon-γ and CXCL9, suggesting migration away from the periphery. These CHMI data confirm that mBC and antibody responses can be induced and boosted by blood-stage parasite exposure, in support of epidemiological studies on low-level parasite exposure. BACKGROUND: Heterologous prime boost immunization with chimpanzee adenovirus 63 (ChAd63) and Modified vaccinia Virus Ankara (MVA) vectored vaccines is a strategy recently shown to be capable of inducing strong cell mediated responses against several antigens from the malaria parasite. ChAd63-MVA expressing the Plasmodium falciparum pre-erythrocytic antigen ME-TRAP (multiple epitope string with thrombospondin-related adhesion protein) is a leading malaria vaccine candidate, capable of inducing sterile protection in malaria naïve adults following controlled human malaria infection (CHMI). METHODOLOGY: We conducted two Phase Ib dose escalation clinical trials assessing the safety and immunogenicity of ChAd63-MVA ME-TRAP in 46 healthy malaria exposed adults in two African countries with similar malaria transmission patterns. RESULTS: ChAd63-MVA ME-TRAP was shown to be safe and immunogenic, inducing high-level T cell responses (median >1300 SFU/million PBMC). CONCLUSIONS: ChAd63-MVA ME-TRAP is a safe and highly immunogenic vaccine regimen in adults with prior exposure to malaria. Further clinical trials to assess safety and immunogenicity in children and infants and protective efficacy in the field are now warranted. TRIAL REGISTRATION: Pactr.org PACTR2010020001771828 Pactr.org PACTR201008000221638 ClinicalTrials.gov NCT01373879 NCT01373879 ClinicalTrials.gov NCT01379430 NCT01379430. Overcoming antigenic variation is one of the major challenges in the development of an effective vaccine against Plasmodium falciparum, a causative agent of human malaria. Inclusion of multiple Ag variants in subunit vaccine candidates is one strategy that has aimed to overcome this problem for the leading blood-stage malaria vaccine targets, that is, merozoite surface protein 1 (MSP1) and apical membrane Ag 1 (AMA1). However, previous studies, utilizing malaria Ags, have concluded that inclusion of multiple allelic variants, encoding altered peptide ligands, in such a vaccine may be detrimental to both the priming and in vivo restimulation of Ag-experienced T cells. In this study, we analyze the T cell responses to two alleles of MSP1 and AMA1 induced by vaccination of malaria-naive adult volunteers with bivalent viral-vectored vaccine candidates. We show a significant bias to the 3D7/MAD20 allele compared with the Wellcome allele for the 33 kDa region of MSP1, but not for the 19 kDa fragment or the AMA1 Ag. Although this bias could be caused by "immune interference" at priming, the data do not support a significant role for "immune antagonism" during memory T cell restimulation, despite observation of the latter at a minimal epitope level in vitro. A lack of class I HLA epitopes in the Wellcome allele that are recognized by vaccinated volunteers may in fact contribute to the observed bias. We also show that controlled infection with 3D7 strain P. falciparum parasites neither boosts existing 3D7-specific T cell responses nor appears to "immune divert" cellular responses toward the Wellcome allele. BACKGROUND: Traditionally, vaccine development against the blood-stage of Plasmodium falciparum infection has focused on recombinant protein-adjuvant formulations in order to induce high-titer growth-inhibitory antibody responses. However, to date no such vaccine encoding a blood-stage antigen(s) alone has induced significant protective efficacy against erythrocytic-stage infection in a pre-specified primary endpoint of a Phase IIa/b clinical trial designed to assess vaccine efficacy. Cell-mediated responses, acting in conjunction with functional antibodies, may be necessary for immunity against blood-stage P. falciparum. The development of a vaccine that could induce both cell-mediated and humoral immune responses would enable important proof-of-concept efficacy studies to be undertaken to address this question. METHODOLOGY: We conducted a Phase Ia, non-randomized clinical trial in 16 healthy, malaria-naïve adults of the chimpanzee adenovirus 63 (ChAd63) and modified vaccinia virus Ankara (MVA) replication-deficient viral vectored vaccines encoding two alleles (3D7 and FVO) of the P. falciparum blood-stage malaria antigen; apical membrane antigen 1 (AMA1). ChAd63-MVA AMA1 administered in a heterologous prime-boost regime was shown to be safe and immunogenic, inducing high-level T cell responses to both alleles 3D7 (median 2036 SFU/million PBMC) and FVO (median 1539 SFU/million PBMC), with a mixed CD4(+)/CD8(+) phenotype, as well as substantial AMA1-specific serum IgG responses (medians of 49 µg/mL and 41 µg/mL for 3D7 and FVO AMA1 respectively) that demonstrated growth inhibitory activity in vitro. CONCLUSIONS: ChAd63-MVA is a safe and highly immunogenic delivery platform for both alleles of the AMA1 antigen in humans which warrants further efficacy testing. ChAd63-MVA is a promising heterologous prime-boost vaccine strategy that could be applied to numerous other diseases where strong cellular and humoral immune responses are required for protection. TRIAL REGISTRATION: ClinicalTrials.gov NCT01095055. Replication-defective adenovirus vectors based on human serotype 5 (Ad5) induce protective immune responses against diverse pathogens and cancer in animal models, as well as elicit robust and sustained cellular immunity in humans. However, most humans have neutralizing antibodies to Ad5, which can impair the immunological potency of such vaccines. Here, we show that rare serotypes of human adenoviruses, which should not be neutralized in most humans, are far less potent as vaccine vectors than Ad5 in mice and nonhuman primates, casting doubt on their potential efficacy in humans. To identify novel vaccine carriers suitable for vaccine delivery in humans, we isolated and sequenced more than 1000 adenovirus strains from chimpanzees (ChAd). Replication-defective vectors were generated from a subset of these ChAd serotypes and screened to determine whether they were neutralized by human sera and able to grow in human cell lines. We then ranked these ChAd vectors by immunological potency and found up to a thousandfold variation in potency for CD8+ T cell induction in mice. These ChAd vectors were safe and immunologically potent in phase 1 clinical trials, thereby validating our screening approach. 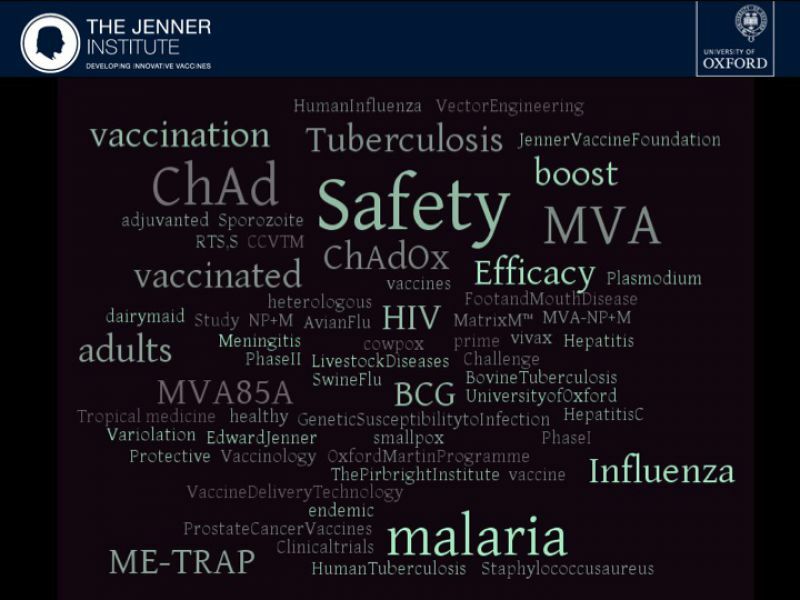 These data suggest that the ChAd vectors developed here represent a large collection of non-cross-reactive, potent vectors that may be exploited for the development of new vaccines. Efficacy trials of antibody-inducing protein-in-adjuvant vaccines targeting the blood-stage Plasmodium falciparum malaria parasite have so far shown disappointing results. The induction of cell-mediated responses in conjunction with antibody responses is thought to be one alternative strategy that could achieve protective efficacy in humans. Here, we prepared chimpanzee adenovirus 63 (ChAd63) and modified vaccinia virus Ankara (MVA) replication-deficient vectors encoding the well-studied P. falciparum blood-stage malaria antigen merozoite surface protein 1 (MSP1). A phase Ia clinical trial was conducted in healthy adults of a ChAd63-MVA MSP1 heterologous prime-boost immunization regime. The vaccine was safe and generally well tolerated. Fewer systemic adverse events (AEs) were observed following ChAd63 MSP1 than MVA MSP1 administration. Exceptionally strong T-cell responses were induced, and these displayed a mixed of CD4(+) and CD8(+) phenotype. Substantial MSP1-specific serum immunoglobulin G (IgG) antibody responses were also induced, which were capable of recognizing native parasite antigen, but these did not reach titers sufficient to neutralize P. falciparum parasites in vitro. This viral vectored vaccine regime is thus a leading approach for the induction of strong cellular and humoral immunogenicity against difficult disease targets in humans. Further studies are required to assess whether this strategy can achieve protective efficacy against blood-stage malaria infection. BACKGROUND: Influenza A viruses cause occasional pandemics and frequent epidemics. Licensed influenza vaccines that induce high antibody titers to the highly polymorphic viral surface antigen hemagglutinin must be re-formulated and readministered annually. A vaccine providing protective immunity to the highly conserved internal antigens could provide longer-lasting protection against multiple influenza subtypes. METHODS: We prepared a Modified Vaccinia virus Ankara (MVA) vector encoding nucleoprotein and matrix protein 1 (MVA-NP+M1) and conducted a phase I clinical trial in healthy adults. RESULTS: The vaccine was generally safe and well tolerated, with significantly fewer local side effects after intramuscular rather than intradermal administration. Systemic side effects increased at the higher dose in both frequency and severity, with 5 out of 8 volunteers experiencing severe nausea/vomiting, malaise, or rigors. Ex vivo T-cell responses to NP and M1 measured by IFN-γ ELISPOT assay were significantly increased after vaccination (prevaccination median of 123 spot-forming units/million peripheral blood mononuclear cells, postvaccination peak response median 339, 443, and 1443 in low-dose intradermal, low-dose intramuscular, and high-dose intramuscular groups, respectively), and the majority of the antigen-specific T cells were CD8(+). CONCLUSIONS: We conclude that the vaccine was both safe and remarkably immunogenic, leading to frequencies of responding T cells that appear to be much higher than those induced by any other influenza vaccination approach. Further studies will be required to find the optimum dose and to assess whether the increased T-cell response to conserved influenza proteins results in protection from influenza disease. Efficacy trials of antibody-inducing protein-in-adjuvant vaccines targeting the blood-stage Plasmodium falciparum malaria parasite have so far shown disappointing results. The induction of cell-mediated responses in conjunction with antibody responses is thought to be one alternative strategy that could achieve protective efficacy in humans. Here, we prepared chimpanzee adenovirus 63 (ChAd63) and modified vaccinia virus Ankara (MVA) replication-deficient vectors encoding the well-studied P. falciparum blood-stage malaria antigen merozoite surface protein 1 (MSP1). A phase Ia clinical trial was conducted in healthy adults of a ChAd63-MVA MSP1 heterologous prime-boost immunization regime. The vaccine was safe and generally well tolerated. Fewer systemic adverse events (AEs) were observed following ChAd63 MSP1 than MVA MSP1 administration. Exceptionally strong T-cell responses were induced, and these displayed a mixed of CD4 and CD8 phenotype. Substantial MSP1-specific serum immunoglobulin G (IgG) antibody responses were also induced, which were capable of recognizing native parasite antigen, but these did not reach titers sufficient to neutralize P. falciparum parasites in vitro. This viral vectored vaccine regime is thus a leading approach for the induction of strong cellular and humoral immunogenicity against difficult disease targets in humans. Further studies are required to assess whether this strategy can achieve protective efficacy against blood-stage malaria infection. © The American Society of Gene & Cell Therapy. Control of bovine tuberculosis (bTB) relies on regular testing of cattle with a crude preparation of mycobacterial antigens termed purified protein derivative (PPD). Worldwide production of bovine PPD uses the Mycobacterium bovis AN5, a strain that was originally isolated circa 1948 in Great Britain (GB). Despite its worldwide use, the AN5 strain is poorly characterised. AN5 was adapted to grow on glycerol in a process similar to that used for the derivation of the BCG vaccine strains; during this process, it is known that BCG deleted the genes for some potent antigens. Our previous analysis of the genome of M. bovis AN5 showed that it had not suffered extensive gene deletion events during in vitro adaptation. However, glycerol adaptation of AN5 strain may have caused differences in its global gene expression profile that could affect antigen expression. To assess this, we determined the transcriptome profile of AN5 and compared it to expression data for two endemic GB strains of M. bovis that account for approximately 61% of all GB bTB cases. Genes expressed at lower levels in AN5 compared to M. bovis field isolates were then screened for antigenicity in naturally infected animals. Using this approach a number of genes were found to be expressed at lower levels in AN5, including those for known antigens. Our results show that field strains of M. bovis show some significant differences in gene expression to AN5, and that this differential gene expression may impact on the antigen profiles expressed by AN5 during in vitro culture. Tuberculous infections caused by mycobacteria, especially tuberculosis of humans and cattle, are important both clinically and economically. Human populations can be vaccinated with Mycobacterium bovis bacille Calmette-Guérin (BCG), and control measures for cattle involving vaccination are now being actively considered. However, diagnostic tests based on tuberculin cannot distinguish between genuine infection and vaccination with BCG. Therefore, identification of differential diagnostic antigens capable of making this distinction is required, and until now sequence-based approaches have been predominant. Here we explored the link between antigenicity and mRNA expression level, as well as the possibility that we may be able to detect differential antigens by analyzing quantified global transcriptional profiles. We generated a list of 14 candidate antigens that are highly expressed in Mycobacterium tuberculosis and M. bovis under a variety of growth conditions. These candidates were screened in M. bovis-infected and naïve cattle for the ability to stimulate a gamma interferon (IFN-gamma) response. We identified one antigen, Rv3615c, which stimulated IFN-gamma responses in a significant proportion of M. bovis-infected cattle (11 of 30 cattle [37%] [P < 0.01]) but not in naïve or BCG-vaccinated animals. Importantly, the same antigen stimulated IFN-gamma responses in a significant proportion of infected cattle that did not respond to the well-characterized mycobacterial antigens ESAT-6 and CFP-10. Therefore, use of the Rv3615c epitope in combination with previously described differential tests based on ESAT-6 and CFP-10 has the potential to significantly increase diagnostic sensitivity without reducing specificity in BCG-vaccinated populations. Genome sequencing of Mycobacterium tuberculosis complex members has accelerated the search for new disease-control tools. Antigen mining is one area that has benefited enormously from access to genome data. As part of an ongoing antigen mining programme, we screened genes that were previously identified by transcriptome analysis as upregulated in response to an in vitro acid shock for their in vivo expression profile and antigenicity. We show that the genes encoding two methyltransferases, Mb1438c/Rv1403c and Mb1440c/Rv1404c, were highly upregulated in a mouse model of infection, and were antigenic in M. bovis-infected cattle. As the genes encoding these antigens were highly upregulated in vivo, we sought to define their genetic regulation. A mutant was constructed that was deleted for their putative regulator, Mb1439/Rv1404; loss of the regulator led to increased expression of the flanking methyltransferases and a defined set of distal genes. This work has therefore generated both applied and fundamental outputs, with the description of novel mycobacterial antigens that can now be moved into field trials, but also with the description of a regulatory network that is responsive to both in vivo and in vitro stimuli. Splice variants of the interleukin-4 (IL-4) cytokine gene have been described for humans, mice, and cattle. IL-4 splice variants have been shown to inhibit IL-4-mediated cellular responses and thus act as IL-4 antagonists. Recent work has highlighted the possibility of a correlation between IL-4 splice variants and protection against clinical tuberculosis. In this study we investigated the potential role of IL-4 splice variants IL-4delta2 and IL-4delta3 in cattle with bovine tuberculosis, using quantitative real-time reverse transcription-PCR. For this analysis we used naturally exposed tuberculin skin test-positive field reactor cattle, uninfected control cattle, and cattle from two experimental models of protective immunity against Mycobacterium bovis: (i) vaccination with M. bovis BCG and challenge with virulent M. bovis and (ii) infection with M. bovis and treatment with isoniazid (INH) prior to rechallenge. The cytokine levels of field reactor cattle were compared to the levels of uninfected controls, while in kinetic studies of BCG vaccination and INH treatment we compared pre-experimental values with sequential samples for each individual animal. The data revealed a significant increase in IL-4delta3 mRNA expression in field reactor cattle, which had no visible pathology compared to cattle with gross pathology typical of bovine tuberculosis. Increased IL-4delta3 expression in both cattle models of protective immunity (BCG vaccination and INH treatment) was transient over time, reaching significance in the INH treatment model. Our results support the hypothesis that IL-4delta3 is involved in protective immunity against M. bovis infection in cattle and are in accordance with clinical studies that have suggested a role for IL-4 splice variants in protective immunity in tuberculosis. New T cell-based blood tests for tuberculosis infection could improve diagnosis of tuberculosis but their clinical utility remains unknown. We describe the role of the ELISpot test in the diagnostic work-up of 13 patients presenting with suspected tuberculosis in routine practice. Of the seven patients with a final diagnosis of active tuberculosis, all were positive by ELISpot including three with false-negative tuberculin skin test results. Rapid determination of tuberculosis infection by ELISpot accelerated the diagnosis of tuberculosis, enabling early treatment initiation. Lalvani A, Millington K, Ewer K.	2007. From the authors 	American Journal of Respiratory and Critical Care Medicine,	175	(2),	pp. 199. Young children exposed to tuberculosis have a high risk of progression to severe tuberculosis disease, but diagnosis of recent infection is hindered by the poor sensitivity of the tuberculin skin test. Whether new blood tests can detect latent infection in this vulnerable group is unknown because there is no gold standard. We monitored a tuberculin skin test-negative infant whose mother had infectious multidrug-resistant tuberculosis with enzyme-linked immunospot, a blood test that enumerates Mycobacterium tuberculosis-specific T cells. The enzyme-linked immunospot test became persistently positive by 6 months, and 18 months later the child developed active tuberculosis despite appropriate chemoprophylaxis. At this point, the magnitude of the enzyme-linked immunospot response increased >10-fold. Our findings demonstrate that this blood test detected latent infection with dormant, yet viable, bacilli and illustrate how enzyme-linked immunospot could improve diagnosis of childhood tuberculosis infection. RATIONALE: The kinetics of Mycobacterium tuberculosis-specific Th1-type T-cell responses after M. tuberculosis infection are likely to be important in determining clinical outcome. OBJECTIVE: To investigate the kinetics of T-cell responses, in the context of a point-source school tuberculosis outbreak, in three groups of contacts who differed by preventive treatment status and tuberculin skin test (TST) results: 38 treated TST-positive students, 11 untreated TST-positive staff, and 14 untreated students with negative or borderline TST results. METHODS: We used the ex vivo IFN-gamma enzyme-linked immunospot assay (ELISpot) to track T cells specific for two region of difference 1 (RD1) antigens, early secretory antigenic target 6 and culture filtrate protein 10, for 18 mo after cessation of tuberculosis exposure. MAIN RESULTS: The treated TST-positive students had an average 68% decline in frequencies of RD1-specific IFN-gamma-secreting T cells per year (p < 0.0001) and 6 of 38 students had no detectable RD1-specific T cells by 18 mo. No change in frequencies of these cells was observed in the untreated TST-positive staff (p = 0.38) and none were ELISpot-negative at 18 mo. Of the 14 untreated students, 7 were persistently ELISpot-positive (all of whom had borderline TST results), and 7 became ELISpot-negative (all but one had negative TST results) during follow-up. CONCLUSIONS: The decrease in M. tuberculosis-specific T cells and their disappearance in a proportion of treated students likely reflect declining antigenic and bacterial load in vivo induced by antibiotic treatment. The observed disappearance of M. tuberculosis-specific T cells in the untreated TST-negative contacts suggests that an acute resolving infection may occur in some contacts. The definition of antigens for the diagnosis of human and bovine tuberculosis is a research priority. If diagnosis is to be used alongside Mycobacterium bovis BCG-based vaccination regimens, it will be necessary to have reagents that allow the discrimination of infected and vaccinated animals. A list of 42 potential M. bovis-specific antigens was prepared by comparative analysis of the genomes of M. bovis, M. avium subsp. avium, M. avium subsp. paratuberculosis, and Streptomyces coelicolor. Potential antigens were tested by applying them in a high-throughput peptide-based screening system to M. bovis-infected and BCG-vaccinated cattle and to cattle without prior exposure to M. bovis. A response hierarchy of antigens was established by comparing responses in infected animals. Three antigens (Mb2555, Mb2890, and Mb3895) were selected for further study, as they were strongly recognized in experimentally infected animals but with low or no frequency in BCG-vaccinated and naïve cows. Interestingly, all three antigens were recognized in animals vaccinated against Johne's disease, suggesting the presences of epitopes cross-reacting with M. avium subsp. paratuberculosis antigens. Eight peptides from the three antigens studied in detail were identified as immunodominant and were characterized in terms of major histocompatibility complex class II restriction element usage and shown to be restricted through both DR and DQ molecules. Reasons for antigenic cross-reactivity with M. avium subsp. paratuberculosis and refinement of the in silico strategy to predict such cross-reactivity from the primary protein sequence will be discussed. Evaluation of the peptides identified from the three dominant antigens by use of larger field studies is now a priority. RATIONALE: Diagnosis of latent tuberculosis infection (LTBI) is currently based on the tuberculin skin test. The enzyme-linked immunospot assay (ELISPOT) is a new blood test to diagnose LTBI. OBJECTIVE: To compare the ELISPOT and the tuberculin skin test for detecting LTBI in contacts of patients with tuberculosis. METHODS: Prospective study of 413 contacts of patients with tuberculosis. MEASUREMENTS AND MAIN RESULTS: Because there is no gold standard for LTBI, the sensitivity and specificity of the ELISPOT and tuberculin skin test cannot be directly measured. For each contact, we therefore estimated the likelihood of having LTBI by calculating a contact score that quantified exposure to and infectiousness of the index case. We analyzed the relationship of contact score to ELISPOT and tuberculin skin test results. The likelihood of a positive ELISPOT (p = 0.0005) and a tuberculin skin test (p = 0.01) increased significantly with rising contact scores. The contact score was more strongly related to the ELISPOT than to the tuberculin skin test results, although this difference was not statistically significant. Among U.S.-born persons and those who were not vaccinated with bacille Calmette-Guérin, approximately 30% had positive ELISPOT or tuberculin skin test results. Foreign-born, bacille Calmette-Guérin-vaccinated persons were significantly more likely to have a positive tuberculin skin test than a positive ELISPOT result (p < 0.0001). CONCLUSIONS: Compared with the tuberculin skin test, the ELISPOT appears to be at least as sensitive for diagnosis of LTBI in contacts of patients with tuberculosis. BACKGROUND: Little is known about factors that affect the risk of acquiring infection in children exposed to Mycobacterium tuberculosis. The effect of BCG vaccination has been difficult to ascertain because the tuberculin skin test (TST), until recently the only method for detecting M tuberculosis infection, does not reliably distinguish between tuberculosis infection and BCG vaccination. METHODS: We investigated risk factors for tuberculosis infection in 979 child household contacts of 414 adult index patients with sputum smear-positive pulmonary tuberculosis in Istanbul, Turkey. Children were aged up to 16 years (median 7, IQR 3-11) and 770 of 979 (79%) had a BCG scar. A T-cell-based enzyme-linked immunospot assay (ELISpot), which is not confounded by BCG vaccination, and TST were used to assess infection. Independent risk factors for infection were identified through multivariate analysis. FINDINGS: Amount of tuberculosis exposure within the household and age (a marker of tuberculosis exposure outside the household) were strongly associated with likelihood of infection as measured by both TST and ELISpot. ELISpot also identified absence of BCG scar as an independent risk factor for infection in tuberculosis-exposed children; BCG-vaccinated children had an odds ratio of 0.60 (95% CI 0.43-0.83, p=0.003) for tuberculosis infection, compared with unvaccinated children. INTERPRETATION: Contrary to the prevailing theory that BCG vaccination protects only against tuberculosis disease, our results suggest that the vaccine also protects against tuberculosis infection. This finding has important implications for our understanding of the biology of tuberculosis infection and development of improved tuberculosis vaccines. BACKGROUND: Childhood tuberculosis often presents non-specifically and is a common differential diagnosis in high prevalence areas. Current diagnostic tools have poor sensitivity and cannot reliably exclude tuberculosis, so overdiagnosis is common. HIV co-infection exacerbates this problem and accounts for an increasing proportion of paediatric tuberculosis worldwide. METHODS: We assessed the usefulness of a T-cell-based rapid blood test for Mycobacterium tuberculosis infection, the enzyme-linked immunospot assay (ELISPOT), in routine clinical practice. We did a prospective blinded study of 293 African children with suspected tuberculosis in kwaZulu-Natal, a region with high HIV prevalence. Children had full clinical assessment, ELISPOT, and a tuberculin skin test. Test results were compared with final clinical and microbiological diagnoses. RESULTS: In children with tuberculosis, sensitivity of ELISPOT was 83% (95% CI 75-89, n=133), significantly higher (p<0.001) than the 63% (54-72) sensitivity of tuberculin skin test (n=116). Sensitivity of tuberculin skin test fell significantly in children younger than 3 years (to 51%), with HIV co-infection (36%), or with malnutrition (44%). Sensitivity of ELISPOT, which was not significantly adversely affected by these factors, was 85%, 73%, and 78%, respectively in these subgroups. In 116 children with both test results available, sensitivity of the two tests combined was 91% (85-95). CONCLUSIONS: Diagnostic sensitivity of ELISPOT is higher than that of the skin test and is less affected by factors frequently associated with childhood tuberculosis in developing countries. Used together with the skin test, ELISPOT provides a clinically useful diagnostic sensitivity in African children with suspected tuberculosis. Molecular epidemiology indicates significant transmission of Mycobacterium tuberculosis after casual contact with infectious tuberculosis cases. We investigated M. tuberculosis transmission after brief exposure using a T cell-based assay, the enzyme-linked-immunospot (ELISPOT) for IFN-gamma. After childbirth, a mother was diagnosed with sputum smear-positive multidrug-resistant tuberculosis. Forty-one neonates and 47 adults were present during her admission on the maternity unit; 11 weeks later, all underwent tuberculin skin testing (TST) and ELISPOT. We correlated test results with markers of exposure to the index case. The participants, who were asymptomatic and predominantly had no prior tuberculosis exposure, had 6.05 hours mean exposure (range: 0-65 hours) to the index case. Seventeen individuals, including two newborns, were ELISPOT-positive, and ELISPOT results correlated significantly with three of four predefined measures of tuberculosis exposure. For each hour sharing room air with the index case, the odds of a positive ELISPOT result increased by 1.05 (95% CI: 1.02-1.09, p = 0.003). Only four adults were TST-positive and TST results did not correlate with exposure. Thus, ELISPOT, but not TST, suggested quite extensive nosocomial transmission of multidrug-resistant M. tuberculosis after brief exposure. These results help to explain the apparent importance of casual contact for tuberculosis transmission, and may have implications for prevention. The secreted Mycobacterium tuberculosis 10-kDa culture filtrate protein (CFP)10 is a potent T cell Ag that is recognized by a high percentage of persons infected with M. tuberculosis. We determined the molecular basis for this widespread recognition by identifying and characterizing a 15-mer peptide, CFP10(71-85), that elicited IFN-gamma production and CTL activity by both CD4(+) and CD8(+) T cells from persons expressing multiple MHC class II and class I molecules, respectively. CFP10(71-85) contained at least two epitopes, one of 10 aa (peptide T1) and another of 9 aa (peptide T6). T1 was recognized by CD4(+) cells in the context of DRB1*04, DR5*0101, and DQB1*03, and by CD8(+) cells of A2(+) donors. T6 elicited responses by CD4(+) cells in the context of DRB1*04 and DQB1*03, and by CD8(+) cells of B35(+) donors. Deleting a single amino acid from the amino or carboxy terminus of either peptide markedly reduced IFN-gamma production, suggesting that they are minimal epitopes for both CD4(+) and CD8(+) cells. As far as we are aware, these are the shortest microbial peptides that have been found to elicit responses by both T cell subpopulations. The capacity of CFP10(71-85) to stimulate IFN-gamma production and CTL activity by CD4(+) and CD8(+) cells from persons expressing a spectrum of MHC molecules suggests that this peptide is an excellent candidate for inclusion in a subunit antituberculosis vaccine. BACKGROUND: Tuberculosis control hinges on prompt diagnosis of active cases and screening of contacts by tuberculin skin testing. Rapid blood tests for Mycobacterium tuberculosis infection are a new alternative to the tuberculin skin test, but whether they improve clinical outcomes is unknown. OBJECTIVE: To describe how a novel T-cell-based test for M. tuberculosis infection helped diagnose tuberculosis in an asymptomatic, immunosuppressed adult with a negative result on a tuberculin skin test. DESIGN: Case report. SETTING: Household contact. PATIENTS: Asymptomatic man receiving maintenance azathioprine therapy for Crohn disease whose wife had multidrug-resistant pulmonary tuberculosis. MEASUREMENTS: Enzyme-linked immunospot (ELISPOT) assay, computed tomography, and bronchoalveolar lavage cultures. RESULTS: The man had a negative tuberculin skin test result and a positive ELISPOT assay result. High-resolution computed tomography of the chest showed consolidation with early cavitation. Bronchoalveolar lavage and culture confirmed multidrug-resistant tuberculosis. LIMITATIONS: This single case report is a proof of concept and is not a formal evaluation of clinical utility. CONCLUSIONS: A positive ELISPOT assay result helped diagnose subclinical active tuberculosis in an immunosuppressed patient with a false-negative tuberculin skin test result. Large prospective studies that compare benefits and costs of this alternative to tuberculin skin testing are needed. The tuberculin skin test for diagnosing Mycobacterium tuberculosis infection suffers from antigenic cross-reactivity of purified protein derivative with BCG, resulting in poor specificity in BCG-vaccinated populations. Comparative genomics has identified several genetic regions in M. tuberculosis and M. bovis that are deleted in M. bovis BCG. Proteins encoded in these regions will form the basis of new specific T-cell-based blood tests that do not cross-react with BCG, but only two, early secretory antigen target 6 and culture filtrate protein 10, have been studied in detail in humans. We investigated four novel gene products, encoded by RD2 (Rv1989c) and RD1 (Rv3873, Rv3878, and Rv3879c), that are absent from most or all of the vaccine strains of BCG, respectively. Sixty-seven overlapping peptides were tested in ex vivo gamma interferon enzyme-linked immunospot assays in 49 patients with culture-confirmed tuberculosis and 38 healthy BCG-vaccinated donors. Forty-five percent (95% confidence interval [CI], 31 to 57%) and 53% (95% CI, 39 to 67%) of the tuberculosis patients responded to Rv3879c and Rv3873, respectively, identifying these proteins as major M. tuberculosis T-cell antigens in humans, while 35 and 25% of the patients responded to Rv3878 and Rv1989c, respectively. Of the 38 BCG-vaccinated donors, 1 (2.6%) responded to peptides from Rv3878 and Rv3879c, 3 (7.9%) responded to Rv3873, and none responded to Rv1989c. Exclusion of cross-reactive peptides encoded in conserved motifs of Rv3873, a PPE family member, increased its specificity to 97.4%. The high specificity of Rv3879c peptides and nonconserved Rv3873 sequences, together with their moderate sensitivity in tuberculosis patients, identifies these peptides as candidates for inclusion in new T-cell-based tests for M. tuberculosis infection. BACKGROUND: The diagnosis of latent tuberculosis infection relies on the tuberculin skin test (TST), which has many drawbacks. However, to find out whether new tests are better than TST is difficult because of the lack of a gold standard test for latent infection. We developed and assessed a sensitive enzyme-linked immunospot (ELISPOT) assay to detect T cells specific for Mycobacterium tuberculosis antigens that are absent from Mycobacterium bovis BCG and most environmental mycobacteria. We postulated that if the ELISPOT is a more accurate test of latent infection than TST, it should correlate better with degree of exposure to M tuberculosis. METHODS: A large tuberculosis outbreak in a UK school resulted from one infectious index case. We tested 535 students for M tuberculosis infection with TST and ELISPOT. We compared the correlation of these tests with degree of exposure to the index case and BCG vaccination. FINDINGS: Although agreement between the tests was high (89% concordance, kappa=0.72, p<0.0001), ELISPOT correlated significantly more closely with M tuberculosis exposure than did TST on the basis of measures of proximity (p=0.03) and duration of exposure (p=0.007) to the index case. TST was significantly more likely to be positive in BCG-vaccinated than in non-vaccinated students (p=0.002), whereas ELISPOT results were not associated with BCG vaccination (p=0.44). INTERPRETATION: ELISPOT offers a more accurate approach than TST for identification of individuals who have latent tuberculosis infection and could improve tuberculosis control by more precise targeting of preventive treatment. OBJECTIVES: An accurate test for Mycobacterium tuberculosis infection is urgently needed. The tuberculin skin test (TST) lacks sensitivity, particularly in HIV-infected individuals, and has poor specificity because of antigenic cross-reactivity with Bacillus Calmette-Guérin (BCG) vaccination. ESAT-6 and CFP-10 are antigens expressed in Mycobacterium tuberculosis, but not in Mycobacterium bovis BCG and most environmental mycobacteria. We investigated whether T cells specific for these antigens could serve as accurate markers of M. tuberculosis infection in an area of high tuberculosis and HIV prevalence. METHODS: Using the rapid ex-vivo enzyme-linked immunospot (ELISPOT) assay for IFN-gamma, we enumerated T cells specific for ESAT-6, CFP-10 and purified protein derivative (PPD) in blood samples from 50 Zambian tuberculosis patients, 75 healthy Zambian adults, and 40 healthy UK residents. TSTs were performed in 49 healthy Zambian adults. RESULTS: All (100%; n = 11) and 90% (n = 39) of HIV-negative and HIV-positive tuberculosis patients, respectively, had detectable ESAT-6- or CFP-10-specific T cells. The ESAT-6/CFP-10-based ELISPOT assay was positive in 37 out of 54 HIV-negative healthy Zambians, suggesting a 69% prevalence of latent M. tuberculosis infection. Fewer HIV-positive Zambians possessed ESAT-6/CFP-10-specific T cells, but the impact of HIV infection was less on this assay than on the PPD-based ELISPOT or TST. CONCLUSION: The ESAT-6/CFP-10-based ELISPOT assay detects active tuberculosis in HIV-positive individuals with high sensitivity. It is more specific, and possibly more sensitive, than PPD-based methods of detecting latent M. tuberculosis infection, and may potentially improve the targeting of isoniazid preventative therapy to HIV-positive individuals with latent tuberculosis infection. Knowledge of the prevalence of latent Mycobacterium tuberculosis infection is crucial for effective tuberculosis control, but tuberculin skin test surveys have major limitations, including poor specificity because of the broad antigenic cross-reactivity of tuberculin. The M. tuberculosis RD1 genomic segment encodes proteins, such as early secretory antigenic target (ESAT)-6, that are absent from M. bovis bacille Calmette-Guérin (BCG) and most environmental mycobacteria. We recently identified circulating ESAT-6-specific T cells as an accurate marker of M. tuberculosis infection. Here, interferon-gamma-secreting T cells specific for peptides derived from ESAT-6 and a second RD1 gene product, CFP10, were enumerated in 100 prospectively recruited healthy adults in Bombay (Mumbai), India. Eighty percent responded to >/=1 antigen, and many donors had high frequencies of T cells that were specific for certain immunodominant peptides. In contrast, of 40 mostly BCG-vaccinated, United Kingdom-resident healthy adults, none responded to either antigen. This study suggests an 80% prevalence of latent M. tuberculosis infection in urban India. Seasonal influenza infections have a significant global impact leading to increased health and economic burden. The efficacy of currently available seasonal influenza vaccines targeting polymorphic surface antigens has historically been suboptimal. Cellular immune responses against highly conserved Influenza A virus antigens, such as nucleoprotein (NP) and matrix protein-1 (M1), have previously been shown to be associated with protection from disease, whilst viral-vectored vaccines are an effective strategy to boost cell-mediated immunity. We have previously demonstrated that MVA encoding NP and M1 can induce potent and persistent T cell responses against influenza. In this Phase I study, we evaluated the safety and immunogenicity of MVA-NP+M1, which was newly manufactured on an immortalized cell line, in six healthy adult participants. The vaccine was well-tolerated with only mild to moderate adverse events that resolved spontaneously and were comparable to previous studies with the same vaccine manufactured in chick embryo fibroblasts. A significant increase in vaccine-specific T cell responses was detected seven days after immunization and was directed against both antigens in the vector insert. This small Phase I study supports progression of this vaccine to a Phase IIb study to assess immunogenicity and additional protective efficacy in older adults receiving licensed seasonal influenza vaccines.